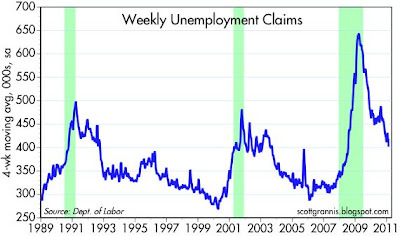 Unemployment claims continue to decline in a fairly impressive fashion. 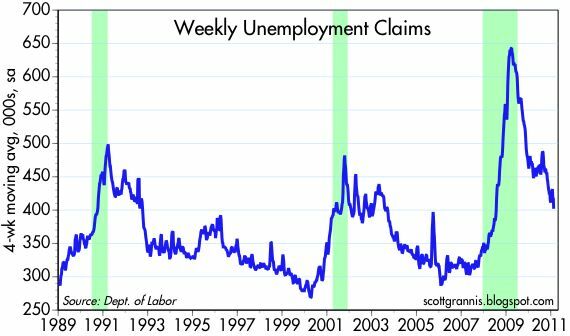 I take this as a sign that businesses have worked very hard to cut costs and trim their labor force; most of the layoffs that were required by the economy's new reality (a housing and financial market bust) have already happened. This sets the stage for a resumption of healthy growth, which should become apparent in the months to come. Below is the same chart I posted yesterday, updated with today's numbers. 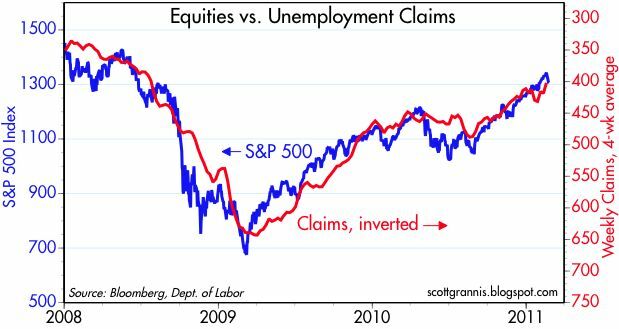 The message is the same: improving economic fundamentals provide strong support for equity prices. Don't you think claims will go up if oil prices continue to rise because of instability in the Middle East? Some analysts say that if Algeria falls, oil prices will spike up over $200/bbl. If that happens, it's hard to see how our economy and the job market doesn't decline. If disaster strikes, that would almost certainly be bad for our economy. Disaster can strike any time, however. How do you prepare for that as an investor? Very difficult, if not impossible. High oil prices are not necessarily disastrous, however. First, consider that our economy is much more energy-efficient today. We use about the same amount of oil today as we did in 1980, even though the economy has more than doubled in size. Second, consider that the windfall profits that would accrue to oil producers if prices rise to $200 can't be immediately spent. Oil producers would almost have to plow all their extra profits back into the economy. Even dollars that we spend on foreign oil never really leave the US economy--they are simply recycled. The real problem with expensive oil is that it can render some kinds of economic activity prohibitively expensive, thus slowing the growth of the economy. Regardless, demand for oil would definitely decline if prices soar, and that would mitigate further price hikes. Meanwhile, higher prices would encourage much more drilling and exploration. Eventually things would come back into balance. central banks will drive the final nail in the coffins. It is their destiny. As you cannot talk about something that has no name, you cannot fight it. Those who pretend to fight inflation are in fact only fighting what is the inevitable consequence of inflation, rising prices. Their ventures are doomed to failure because they do not attack the root of the evil. They try to keep prices low while firmly committed to a policy of increasing the quantity of money that must necessarily make them soar. As long as this terminological confusion is not entirely wiped out, there cannot be any question of stopping inflation."